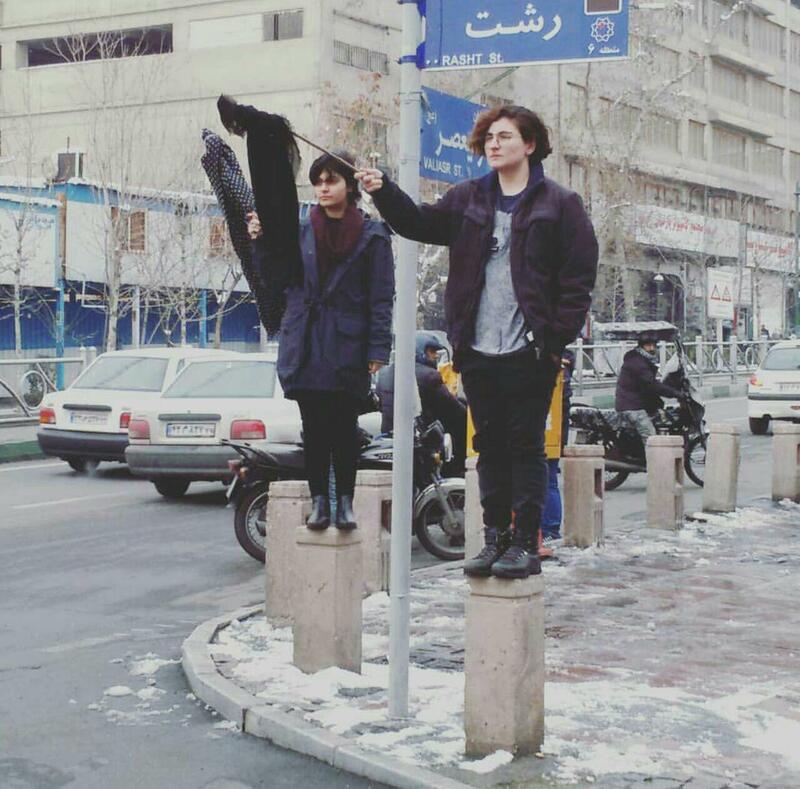 Iranian authorities dismissed the recent protests against compulsory hijab describing them as scattered and insignificant acts. 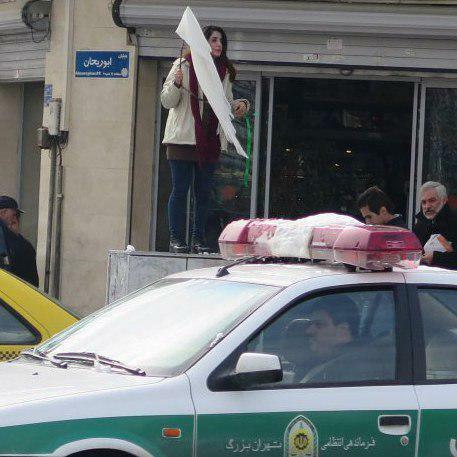 Iran’s Prosecutor General described the protest of a young woman on Enghelab Street to compulsory hijab as “an emotional childish act instigated by forces abroad”. To protest Vida Movahedi climbed an electric transformer box on Enghelab Street holding a stick at the end of which she had attached her white headscarf. 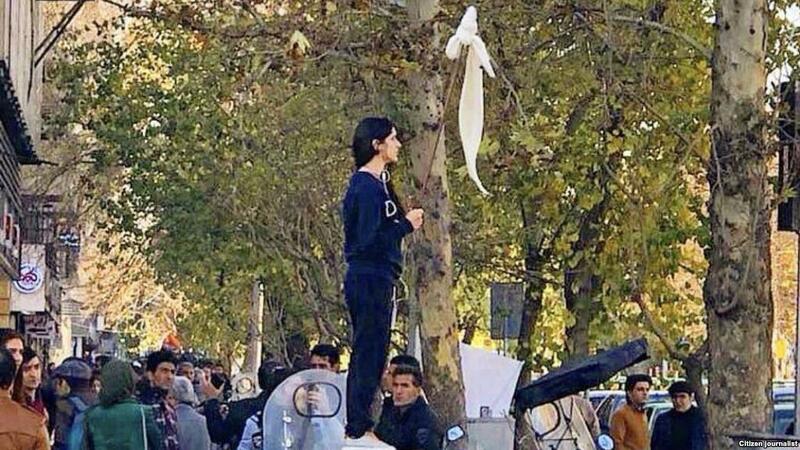 Last month, at the same time that widespread protests were staged across the country in Iran, Vida Movahedi climbed an electric transformer box on Enghelab Street holding a stick at the end of which she had attached her white headscarf. Her image was immediately transformed into a symbol for the ongoing protests against compulsory hijab in the country. Later it was reported that Movahedi had been arrested by the authorities. Prominent human rights lawyer, Nasrin Sotoudeh, who had announced in her Facebook that she is pursuing the matter, reported on January 28 that Movahedi had been released. On Monday January 29, several other women in Tehran and Isfahan carried out similar acts and their photos were widely circulated on social media. Mohammadjafar Montazeri, Iran’s Prosecutor General has dismissed the events as few and negligible adding that in the country’s general populace, majority is with those who wear the hijab and their modesty and morality prevents them from committing such acts. Meanwhile reports indicate that a police van has been stationed at the location where Movahedi began the protest. More women joining the protest in Tehran. Montazeri conceded that no one should interfere in people’s private lives adding that however, laws have to be abided by in society. Meanwhile, Tehran Prosecutor Abbas Jafari Dowlatabadi has confirmed that one individual was arrested in connection with the women of Enghelab Street on 29 January. In response to whether a bail of 500 million toumans ($150,000 U.S. dollar) was set for the woman who was arrested on the 29 January, Dowlatabadi said he has no information regarding the bail but could say that it would be commensurate with the crime. He added that those involved in such demonstrations will be charged in the future. Reports from activists and lawyers indicate that Nargess Hosseini was arrested on Monday January 29 and the court has set a 500 million touman ($150,000 U.S. dollar) bail for her. Nasrin Sotoudeh had announced earlier that she had been retained by Hosseini’s family as her lawyer. Nargess Hosseini moments before getting arrested on Monday January 29. Talking to local media, Montazeri insisted that hijab is vital for the country and those who believe in Islam will observe the hijab in public adding that this issue was not just a legal matter. Montazeri linked the protests to foreign bodies adding: “In my view, those who do these things are acting on their ignorance and influences from abroad. These acts are childish. It is imperative to note that such acts have no effect on our society.” Montazeri stressed that disregarding the hijab is a crime but maintained that warnings would be the better way to handle offenders in this matter. Protests in the form of civil disobedience and widespread demonstrations against compulsory hijab were triggered in Iran from the day women were first obligated to don the hijab by law following the 1979 Revolution. In recent years the protests persist in campaigns such as My Stealthy Freedom and White Wednesdays which invites Iranian men and women to wear white scarfs, hijab or bracelets on Wednesdays to express solidarity with the movement against compulsory hijab. According to an amendment to Article 638 of the Islamic Penal Code, a woman appearing in public without hijab can be sentenced to up to two months in jail or 50 thousand toumans ($12) in fine.